Pete Smith directs Oxford Gamelan Society, an Oxford-based group dedicated to performing on these traditional Indonesian instruments. Ahead of their next concert at St John the Evangelist Church on the 14th February, I spoke to him about what the Gamelan is, the traditions that surround it, and its influence on Western composers. The Gamelan is an Indonesian orchestra of bronze metallophones. It is a percussion ensemble made up predominantly of gongs, metallophones, and chimes, all hand-forged in bronze and mounted on exquisitely carved frames and beds with snakes, tropical plants, and other decorative embellishments. The Oxford Gamelan comes from central Java. It’s been part of the university since 1983, and we are the country’s oldest established community Gamelan group. We meet regularly on Wednesdays in term time to play and learn on the heirloom gamelan ‘Kyai Madu Laras (‘The Venerable Sweet Harmony’) by kind permission of the Bate Collection of Musical Instruments and we have a wide age range of players both from the university and from the wider community. 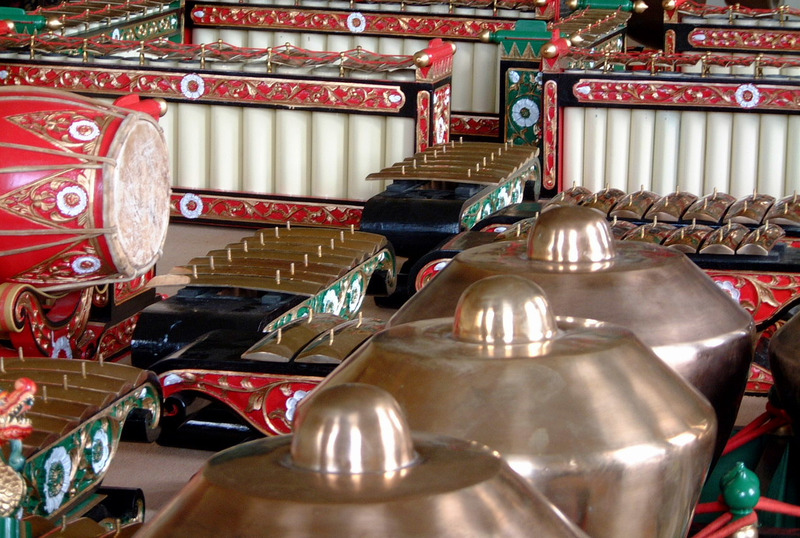 An orchestra of metallophones is quite different from the Western symphony orchestra, so how does the Gamelan function? It’s like a cross between traditional jazz and integral serialism, really! It’s largely a repertoire of traditional melodies, and these act as contours around which an ensemble of about twenty players and singers embellish in set ways. What are the contexts in which this music is played? Does it have a ritual or religious function? Up until recently Gamelan was what the people of Java made music with. Everything happened on a Gamelan. In a predominantly muslim country Gamelan has lost any historical link with religion but the ritual and ceremonial aspects of Gamelan is still very important – you can’t really get married without the sound of a Gamelan, even if it’s just on cassette. However although what’s filtered over to the West is the idea of an exclusively ritualized and ceremonial performance context and a repertoire of sophisticated court music you will also hear ‘cheesy’ urban ballads easy, raucous folk music, and reinterpretations of pop tunes played on the Gamelan. Is there a difference between the way we use the term ‘music’ in the West compared to the Indonesian usage? Essentially, there’s no difference. But their musical theory, the impetus behind their music, is very different. There’s no harmonic basis to the Gamelan, it’s heterophonic. It works in layers of melodies within a musical structure. You have three types of musicians playing within an ensemble of anything up to 25 players: 2 are basically the gatekeepers who define the structural moments, particularly with the gongs. A gong will sound at the end of every cycle, and this is the backbone of the orchestra and tells the other players where they are. Then there is an underlying group of players who play the basic melody. Then you have a group of players who improvise over the top of that. So they hear music in a different way. Our classical music won’t mean much to them. Their musical culture is one that appreciates music that unfolds gradually rather than surprising you. But the Indonesians are among the most musical cultures in the world – the Malaysian government currently has a quota on the amount of Indonesian pop music that it allows into the country because they’re worried that unregulated it will totally dominate their own music scene. Many of the main musical trends in South East Asia at the moment are driven by Indonesian creativity. Where you talk about cyclical structures and punctuating instruments, how does this fit with Western art music that has taken the Gamelan as an influence? If you take Debussy as an example, the main thing you can see in his work particularly is that he latches onto fixed pedal points. In ‘Pagodes’ from Estampes there is a real sense of layering textures, and slow-moving melodies with faster filigree of decoration over the top. Of course if you played this music to a Javanese musician they wouldn’t describe it as Gamelan – for a start it’s not in slendro, the pentatonic scale used by the Gamelan (the other most common scale has seven notes and is called pélog). It’s also quite homophonic, as opposed to the heterophony that you described before. Yes, but it does stick to deep pedal points which both blur tonality as well as establish it, and come directly from the sound-world of the Gamelan. As far as composers like Godowski are concerned, he was hearing this music through a highly romanticized, Germanic mindset. But he picks up on the scales and, as with Debussy, the low gong-like pedal points and percussive ostinati more than anything else. What, if any, is the difference between Gamelan from Java and Bali? Balinese Gamelan is essentially outdoor music. In some ways it’s more like through-composed music, whereas Javanese is much more like jazz. A group of skilled Javanese musicians come together and make something of a piece following shared knowledge of improvisatory techniques , whereas Balinese musicians will rehearse every week and create and recreate pieces, far closer to the Western art music idea of ‘a composition’. The other main difference is that Balinese Gamelan is very loud. Because it is usually played outdoors, the tuning system has pairs of instruments that are not quite in tune with each other to create a sonority between them. About 90% of Javanese Gamelan involves a integral vocal component; Javanese music is full of songs! There’s very relatively little singing in Balinese Gamelan . . . perhaps because of how loud the instruments are. When you talk about parallels with jazz, is a lot of Javanese Gamelan improvisatory? Yes. You can’t really perform Gamelan without some degree of improvisation. In a sense the main melody works a little like a figured bass – the performers will know the main contours of the tune and they will know how to treat that on the decorating, embellishing instruments. All of these have a different character and function – there are xylophones, flutes, zithers, two-stringed violins – and the musicians will run with the basic contour according to the character of their instrument. You’re performing at St John the Evangelist on the 14th February – can you tell me a little about the concert? It’s a charitable event, in collaboration with the Mandala Trust, a UK-based charity dedicated to supporting children and young people in vulnerable situations around the world. The Oxford Gamelan Society regularly perform around the city but the fresh angle of this concert is that it’s not purely a Gamelan programme. It’s a mixture of classical Javanese music and dance – we’re working with a London based dance company called Lila Bhawa – and music by largely twentieth century Western composers who have been influenced by the Gamelan, starting with Debussy. He heard the Gamelan at the Paris Exhibition and said that ‘Beside the Javanese Gamelan, Palestrina sounds like child’s play.’ Pianist Cliodna Shanahan will be playing works by him, Ravel, Ligeti, and Godowski. While Debussy heard the Gamelan in Paris, Godowski travelled extensively in the Dutch East Indies and came back with ideas – it’s interesting to see how neither composer attempted to transcribe Gamelan but nonetheless clearly ‘got’ it, how the Gamelan filtered through their consciousness. Both were clearly impressed by the overall sound. We’re also doing the Lou Harrison Double Concerto for Violin, Cello, and Javanese Gamelan with a violinist and cellist from the Oxford based group ‘The String Project’, and the UK premiere of a piece by Oxford University graduate composer James Telford. Will the dance be predominantly traditional? Yes, very traditional. Most of the music that we will be playing is nineteenth/ early twentieth century Javanese music, which is what would both Debussy and Godowski would have heard. So seeing as we’re playing Javanese music from around that period we’ve decided to pair it with dance from the same period with the express idea that this is the type of dance these composers would have witnessed. Also, for audiences who’ve never seen or heard Javanese music, this gives a visual element to the performance as well; an eloquent insight into the underlying aesthetics and emotions behind the music. Will you be drawing on the tradition of shadow puppet theatre, which the Gamelan traditionally accompanies? No, because we performed with a puppet theatre at the Pitt Rivers last term. This performance will be more dance based. Certainly there is an element of the shadow puppetry in the dance, a lot of the movements are borrowed from puppetry. Are you having to alter anything to fit with the church setting and acoustic? Not really. The Gamelan is designed, ideally, to be played in an open-sided pavilion, so you can hear every individual melodic strand everywhere but also achieve a luxurious wash of sound. I think the setting of St John the Evangelist will work beautifully with the Gamelan – we won’t amplify or alter anything, so I’m looking forward to it! 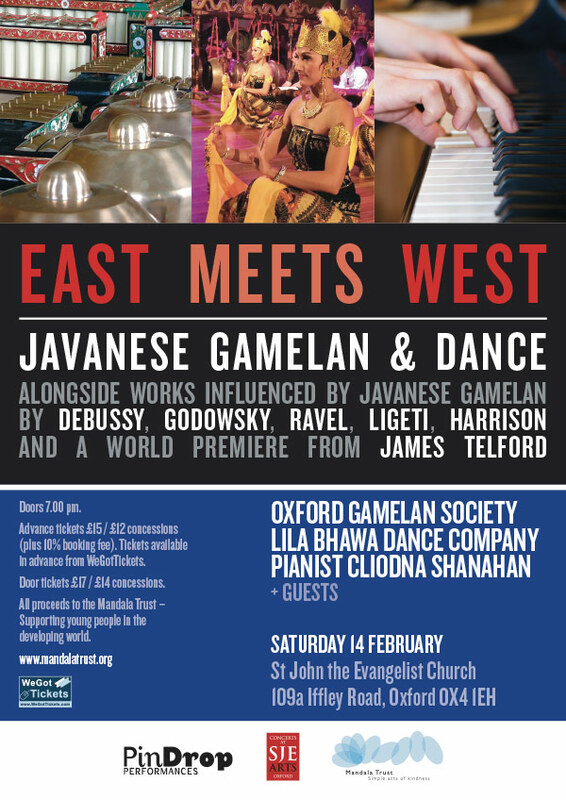 Oxford Gamelan Society will be performing at St John the Evangelist church on 14th February; tickets can be bought from the Truck Store in Cowley, and online from WeGotTickets. For more information about the event, please visit the St John’s website. The Oxford Gamelan society meet on Wednesdays during term time at the Faculty of Music on St. Aldates. Beginners are always welcome and no musical training is necessary to start, just the ability to sit on the floor. For more information about joining OGS please email enquiries@oxfordgamelan.org or phone 01865 510815.